Millions of Ontarians need a vehicle to handle the basic necessities of life: getting to work, buying groceries, taking the kids to school. But not everyone can secure the financing they need to buy a vehicle. Our car loan service makes getting a car loan in Ontario easy -- applicants enjoy speedy approvals and a loan process that's transparent and easy to understand. Our auto loan rates in Ontario are market-competitive. I went bankrupt and ruined my credit. Will I be able to get a car loan? Yes. We work with all Ontario drivers, regardless of your credit score. I live in a small town in Ontario. Can I still get a car loan through your site? Yes. We offer car loans in Toronto and other big cities, but we also offer car loans in smaller regions all across Ontario. It doesn't matter if you live in Cornwall or Kingston, Whitby or Windsor, or anywhere else in the province, we'll match you with a dealer in your area who can set you up with financing. How much tax will I have to pay when I buy my car in Ontario? The total sales tax (HST) payable in Ontario is 13% of the vehicle's purchase price. Can I roll the HST into my car loan? If you're buying from a dealer, yes. In fact, many dealers include HST in the purchase price, so the price you see is the price you pay. What do I need to qualify for a car loan? You must be at least 18 years old, make $1,500 a month, be employed, have a driver's license, and be a Canadian resident. How much will the interest rate be on my car loan? The details of your car loan will be handled at the dealership level. Dealers in Ontario set auto loan rates based on your financial profile (credit, monthly income, etc.) and the size of your loan. In this struggling economy, is it hard to get a car loan in Ontario? Used car financing has actually picked up over the last 5 years in Ontario, and most drivers continue to make their payments on time. How does the length of the car loan affect my monthly payment? Longer loans mean lower monthly payments. On the flipside, you'll end up paying more interest over the total life of the loan. 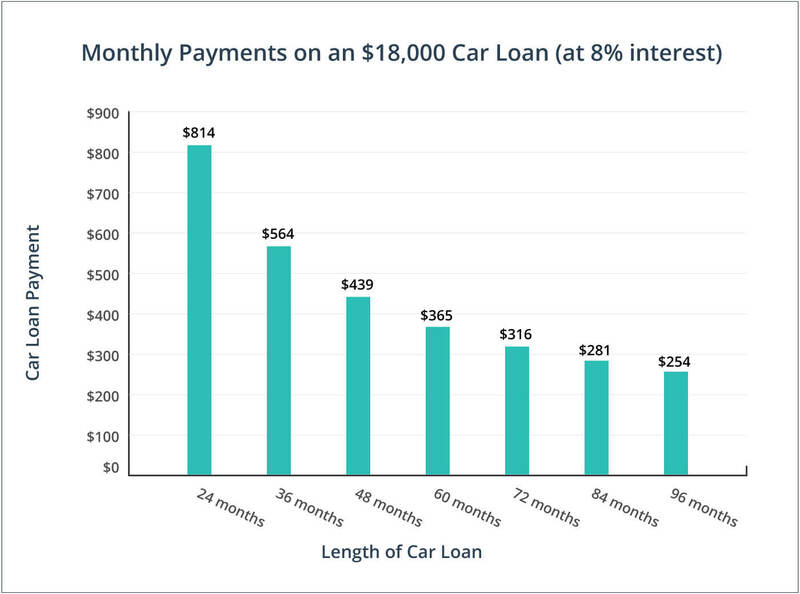 If you can handle the monthly payments, it's better to get a shorter car loan — you'll pay less interest. Dealers registered with the Ontario Motor Vehicle Industry Council have to follow a variety of consumer protection practices and make important vehicle disclosures to buyers. The OMVIC exists mainly to help consumers. They want Ontarians to have a positive car-buying experience, so don't hesitate to contact them before — or after — you buy your vehicle. Does the car you're interested in have a good reliability record? How much does it cost to insure? Remember, your car payment is only one part of the total cost of operating your vehicle. You need a FICO score above 670 to qualify for used vehicle financing. False. You can get a car loan no matter how low your credit score is. A 2014 study by the Bank of Canada found that 25% of all auto loans were non-prime (borrowers with FICO scores under 670). It's better to buy a used car from a private seller than from a dealer. False. Used car buyers are only entitled to the safeguards and protections of the Ontario Consumer Protection Act if they purchase a vehicle from a registered dealership. There's a 'cooling off' period for used car buyers in Ontario. False. Used car purchase contracts are binding and all sales are final in Ontario. A survey done by the Ontario Motor Vehicle Industry Council found that an astounding 87% of Ontarians think there is a cooling off period for used car purchases. You don’t pay sales tax on ‘classic’ used vehicles (over 20 years old). False. Sales tax is payable no matter what year the vehicle is. That includes classic cars. By law, used car dealers in Ontario have to include all fees and charges in the advertised price of a vehicle, except for HST and the cost of adding the license plate. The Motor Vehicle Dealers Act requires dealers to disclose if a vehicle was previously used in a rental fleet or as a taxi, limo, or emergency services vehicle. In cases where a dealer does not disclose that information prior to sale, the buyer can seek financial remedy through the Dealers Compensation Fund. Used car dealers are also required by law to provide the vehicle’s mileage, make, model, and year before completing the sale. Buyers can cancel the sale and get a full refund within 90 days of purchase if the dealer doesn’t disclose these details. Used car sales in Ontario are up by more than 20% year-over-year. Experts trace the sales boom to the low Canadian dollar, which is luring many U.S. buyers across the border to buy used vehicles. More than 80% of all used vehicles purchased in Canada by U.S. residents are bought in Ontario, according to Statistics Canada.